Choose from varying massage styles at the same great price, inclusive of gratuities. *You can add aromatherapy for no extra cost. One of the world’s most well-known massages, which is based on long hand strokes with oil to soothe sore muscles. Deep tissue techniques target specific muscle groups and move into deeper layers of soft tissue for maximum relief of pain or soreness. Trigger point or acupressure can be applied within this style of massage. Range of motion work is also incorporated to open joints such as hips, shoulders, and knees. Gentle techniques to help alleviate muscle ailment during pregnancy and help unite the mom with breathing techniques to connect with her baby. No aromatherapy or thermotherapy used for these sessions. Shiatsu in Japanese means “finger pressure”; it is a type of alternative medicine consisting of finger and palm pressure, stretches, and other massage techniques. Reflexology, or zone therapy, is an alternative medicine involving the physical act of applying pressure to the feet, hands, or ears with specific thumb, finger, and hand techniques. The biomat is a full body heating pad for sore joints and muscles. Inside the pad is a special technology combining infrared rays, negative ion effects and the conductive properties of amethyst crystals. 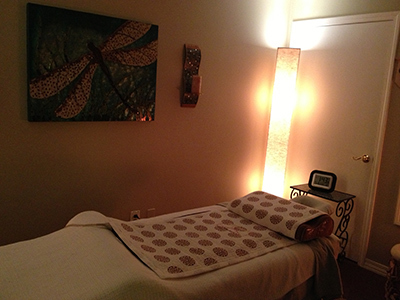 This therapy is extremely relaxing and can be integrated into any session.